I’ve always had an uneasy relationship with asafoetida, or hing as we call it in Gujarati. Even though it is traditionally an extremely common ingredient in Indian cooking, I don’t often cook with it and when I do, I always use it in extremely tiny quantities (no more than a tiny pinch). 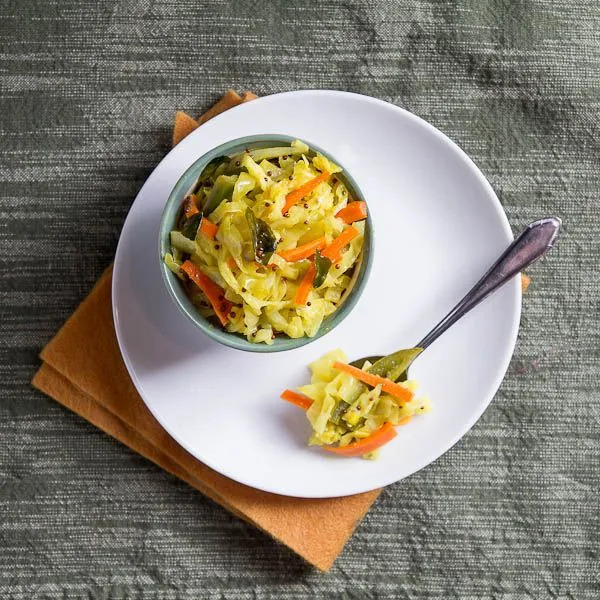 (by Simon Daley and Roshan Hirani), a wonderful cookbook about Gujarati Muslim home cooking, and came across a recipe for cabbage that called for a full half teaspoon of asafoetida. I wouldn’t normally use that much asafoetida in a whole month’s worth of cooking! It seemed very unusual to me but I was intrigued. Would the flavor be overpowering? Would the cabbage smell funky? I decided to be brave and try it. I really liked it. The asafoetida imparts a smooth onion-y flavor that is delicious with the cabbage. Now I feel like I’ve been missing out on a really interesting ingredient in my spice cabinet. I’ll definitely be experimenting with asafoetida a lot more from now on! Heat oil in a wide saute pan. When the oil begins to shimmer, add mustard seeds, asafoetida, green chili, and curry leaves (don’t add now if using cilantro, add at the end). 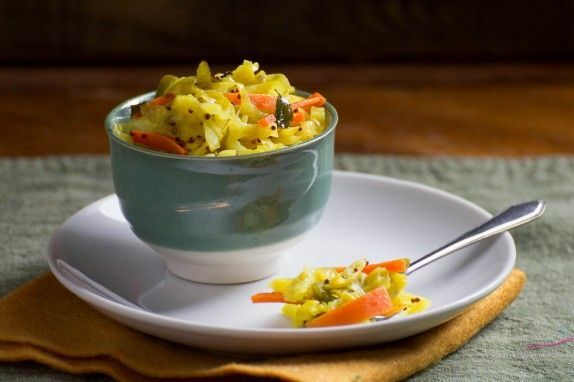 Toss in the cabbage, carrot, turmeric, and salt. Mix well. 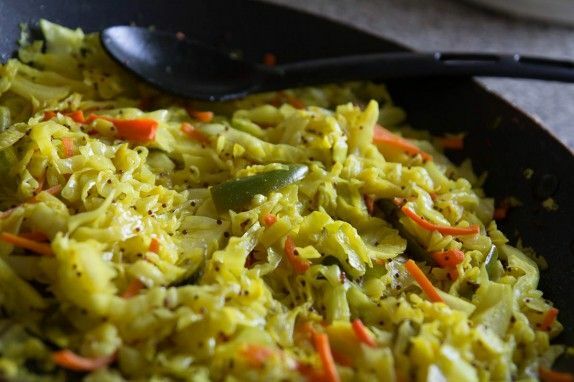 Cover and cook for 8 to 10 minutes until the cabbage has softened but still has a crunch. Cook uncovered until the liquid cooks out. Turn off heat and add in the lemon juice (and cilantro). Mix well. Comments on "Cabbage Saute with Mustard and Asafoetida (Sambharo)"
Hi there. How much mustard seeds? Seems to be missing in ingredients list. Thanks for catching that! It should be 1/2 tsp of mustard seeds. I've changed it on the recipe. Thanks! Love your blog! Keep it coming. I've just started getting into cooking indian food and I am planning to make tonight. Thanks for the recipe. I made it for dinner tonight and it was wonderful.